I have been very excited about the prospect of showing you the finished garden at Reigate – it looks really fabulous, even if I do say so myself! Before I reveal the “after” pictures, I thought you might like to see the “before” pictures…. 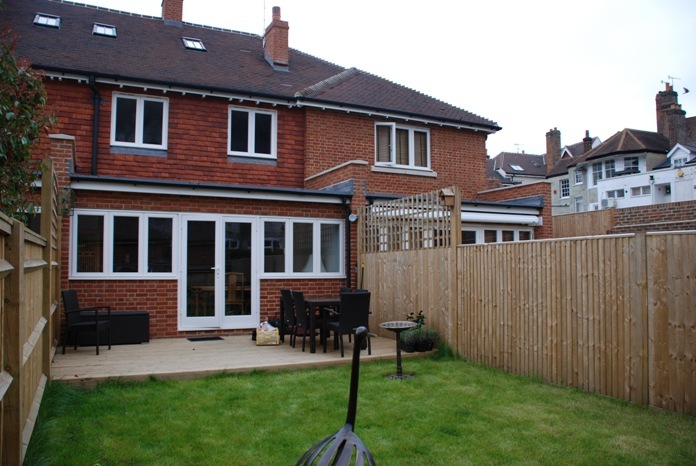 As you can see, it really was a blank canvass, a small garden (just 50m²) attached to a new build property which had been laid mostly to lawn. The small decked area by the house hadn’t been constructed very well and was already starting to lift in parts. My client, Stevie, wanted some “wow” factor. 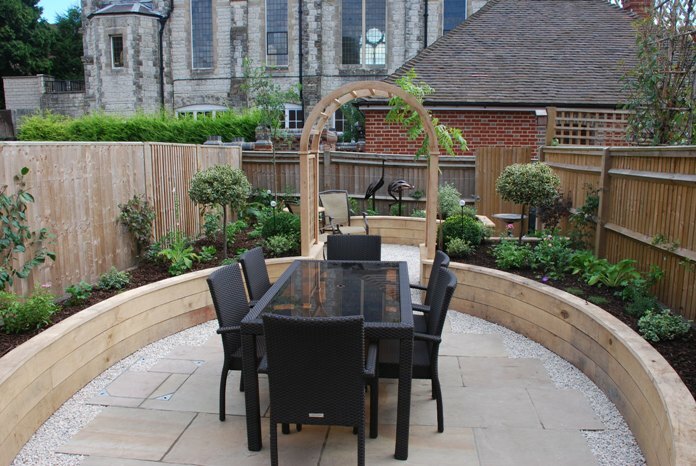 She asked for raised beds and romantic planting, somewhere she could entertain friends and relax on a warm summer’s evening with a glass of something cold. When I took the brief, Stevie expressed a desire to have raised beds constructed from railway sleepers, but she really wanted curved beds and sleepers didn’t really lend themselves to the task in hand. This sparked a phone call with a good friend of mine whose company specialises in timber work in the garden (English Garden Joinery). He promptly told me that “anything is possible” and explained that a framework could be built and clad with green oak. Green oak moves and cracks as it weathers so the rustic appearance of sleepers would evolve over a period of time. I wanted to create 2 areas within the garden, one for entertaining, and another to catch the evening sun. Dividing the garden into 2 rooms will make the space feel much larger because it won’t be possible to see the whole garden from any one place. 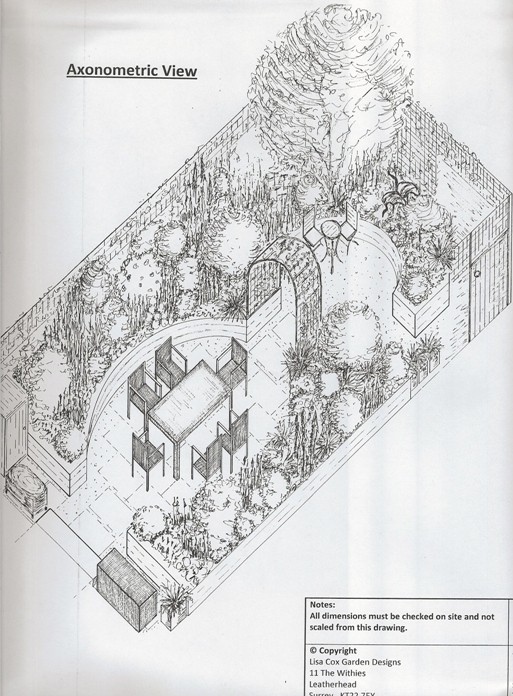 The archway was designed to give the garden some 3-dimension and really define the two areas. Eventually this will be covered with wisteria and scented roses. 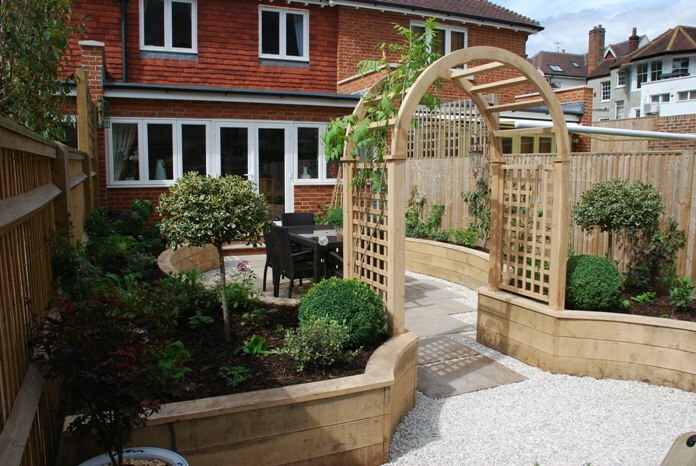 The construction and planting was completed on Saturday and here is the finished garden….. I am really thrilled with the finished result and when I left on Saturday, Stevie was grinning from ear to ear! She certainly has the “wow” factor now and once the planting has had chance to grow and establish, it will be a secluded haven, full of scent and romance – what do you think? looks great, totally understand why you’re grinning, and havn’t they got a lovely view, – if it has to be buildings you’re looking at, – that’s quite a good one!- the curved lines look great. Can you persuade them to make the fences disappear – al la your last post? 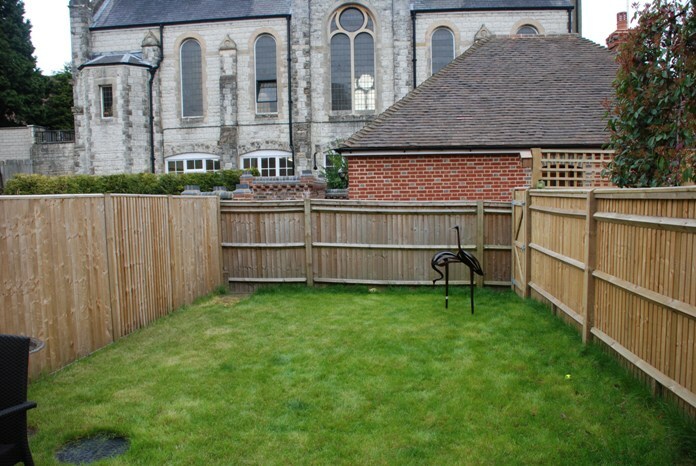 Thanks Claire – when she said she had a church at the end of the garden, I didn’t expect that! Tried the black fence suggestion, but she just wasn’t comfortable with it….once the climbers have had chance to do their thing, they should disappear that way. Wow – that really looks fantastic Lisa. I’ve spent rather a lot of the Bank Holiday weekend in my garden, but I have a feeling even if I had spent years I wouldn’t have achieved anything with this much impact. Wow! Fantastic to see this in the flesh. I loved this from your sketches but it’s fab to see it properly built. You must be so proud! A belated thanks Fiona – feel really proud! A belated thanks, Nicky – much easier to create impact when you have a blank slate – I’m sure your garden is lovely!